IDJ has sent these these photos of CMA Trade Exhibitions. Also 1967. 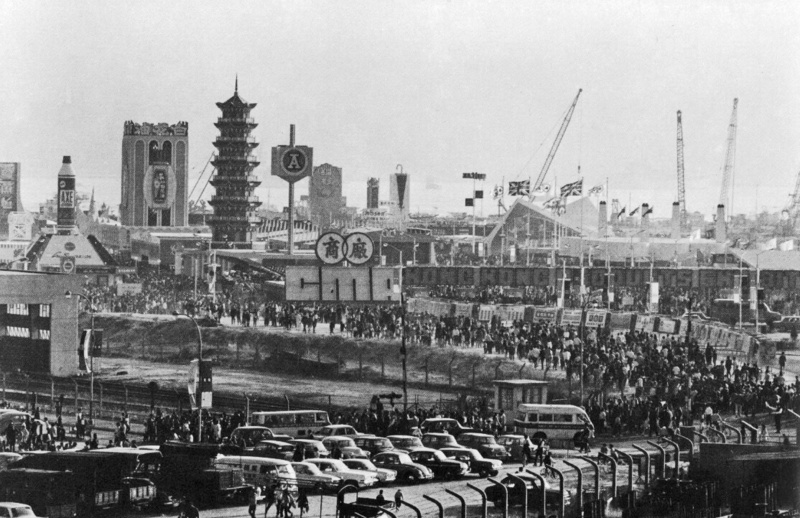 Also Hung Hom? Next Wanchai. 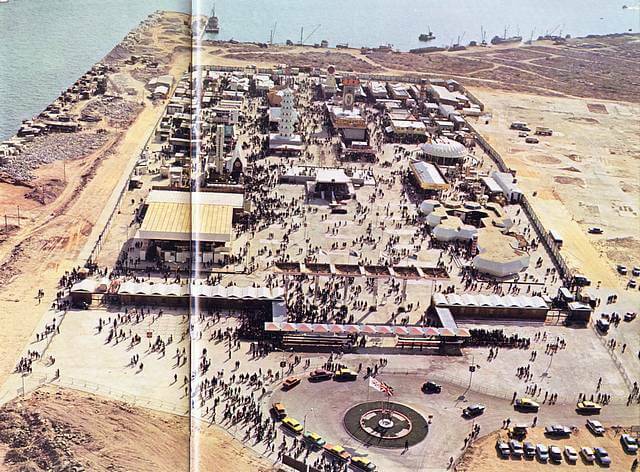 Can anyone identify details:- streets, reclamation, harbour front details (what is the long structure on the harbour front right)? And can anyone translate the names of any companies from the exhibition? 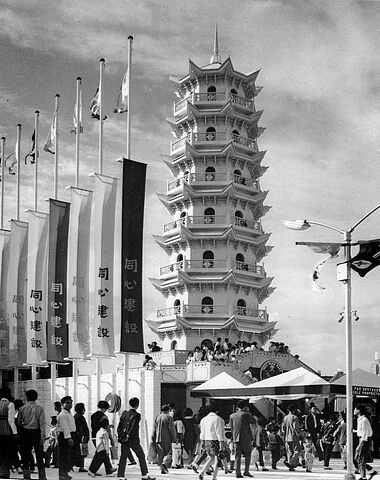 The 1967 photo showed a replica of the Tiger Balm Pagoda That is solely the Tiger Balm booth. The other photographs are soft of difficult. Only the bigger signage are readable. How big are the original photos please? The V-shaped pedestrian overpass is just visible if you look left of the then-brand new Wan Chai Ferry Pier, crossing Gloucester Road towards the reclamation and then doubling back on itself. In the foreground is the looping entrance to the not-yet-open Cross Harbour Tunnel. That ferry pier, incidentally, would seem still to be attached to the long structure you asked about. 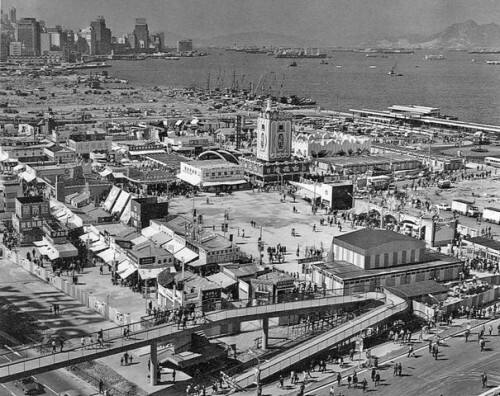 It appears that there was originally a covered walkway running along the harbour front on either side of the pier. Look just beneath the right-most of the two large ships you see in the harbour, and you’ll spot the Asahi Pentax sign that was casting the shadow. You’ll also see the covered walkway from an angle more like that in your own image. The pier behind it looks to still be under construction, explaining why there’s not a visible pier in your image — the walkway arrived before the pier was built. Perhaps the covered walkway was a short-term measure, and ferries temporarily docked alongside the sea wall, rather than at the not-yet-completed pier? Anyway, between the location of the pier and the entrance to the Cross Harbour Tunnel, I’m going to guess the exhibition took place around where the Sun Hung Kai Centre and Wan Chai Swimming Pool now sit, with the V-shaped overpass taking pedestrians to the recently-extended Tonnochy Road. Harbour Road isn’t there yet; you can see that under construction in my second image above. Yes. That foot bridge in the foreground had been rebuilt in the late 1980’s or early 1990’s and it should be on Stewart Road, crossing Gloucester Road. I remember the old bridge in the photo was demolished using some very special equipment. The walkway was lifted off after closing traffic in the small hours, but the supporting pillars were broken down by drilling holes into the concrete and then they fill the holes with water and covered with custom shields, then they start freezing the water and use the expansion of ice to break the concrete. You do not hear the jack hammers for this project. The generators to reduce the heat wasn’t that loud. I am uncertain if this freeze to break way of demolition had been used elsewhere in Hong Kong.